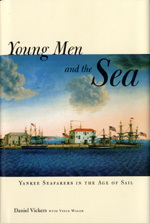 The purpose of these web pages is to provide an example of the data which Dr. Daniel Vickers and I used in arriving at the conclusions presented in the Young Men and the Sea: Yankee Seafarers in the Age of Sail. Information from our research was taken from numerous sources and stored in a series of database files. In these pages we have presented four of these databases. Three display voyage data for over 5000 mariners who called into or shipped out of Salem, Massachusetts from 1641 to 1850. Some were born abroad or elsewhere in New England; others were of local origin. And one database contains the Salem tax and tax valuation lists for selected years between 1683 and 1850. We stored data on voyages in three distinct databases based on the type of information extracted. Each voyage of a mariner constituted a record in the database. A mariner qualified for inclusion if we could identify him by name and rank on a voyage of known date, and unless otherwise indicated, we created a record for each voyage he undertook. In the first voyage file, entitled "General Voyage", covering the years 1641-1830, we entered records of voyages from numerous sources, which frequently provided different kinds of information. This resulted in a database containing more fields and more information than the other two. Although not the largest database (with 4375 records), it was the voyage file we spent the majority of time developing. The "General Voyages" database includes some files from the 19th century, but it focuses most heavily on the 17th and 18th centuries. Our first attempt to provide comparative data for the 19th century was to develop a sample database of seafarers from crew lists for the years 1803-1840. Called "'A' Voyages" our aim was to create a representative sample by arbitrarily choosing surnames which began with the letter "A". The tax and tax valuation lists database contains a complete list of taxes paid by individuals in Salem, Massachusetts, for the years 1683, 1690 and normally every 5th year following, up to 1770, and a list of tax valuations for 1777, 1785, for every five years following up to 1825, and then for 1829, 1834, 1840, 1845 and 1850. The database is presented in 33 html documents, listing taxpayers sorted in descending order by the value of taxes paid or valuations assigned. Each document is separated into deciles with the top decile, indicating the wealthiest 10% of Salem society, given the value of 1 and the lowest decile given the value of 10. These tax and valuation lists played a central role in determining the levels of wealth of the town's seafaring community for the period the tax and valuation lists cover. In addition, we have designed several aids for use with these databases. First, for genealogists, we have created an alphabetical listing of all seafarers mentioned in the three voyage databases. Second, we have supplied a table of explanations for the abbreviations that appear in the databases, especially in the source fields. Third, we have created a list of the sources we used in creating the four databases. Finally, we have provided a more detailed explanation of the tax tables. These aids may be accessed from links in the left side bar of each page immediately below the "Contents" heading. When we created these files for internal use we were never very concerned about the occasional spelling error. The spelling of names in particular was made difficult by the highly variable handwriting of the period we were studying and by the erratic legibility of the documents. We knew what we meant, and for our purposes that is all that mattered. But, of course, presenting our data to the public is another matter. We have thus made every reasonable attempt to correct any errors. For any that we may have missed we apologize and hope you will inform us of them. Any errors or comments may be sent to yms@donwalsh.com. We hope you will find the information on our web site useful.